The Devil’s Harvest Seed Company was born of a simple desire: to craft and make readily available new indica hybrids of Cannabis that would give smokers a “kick in the head.” Tasty, heavy-hitting, high-yielding strains are the general goal of this pair of Amsterdam breeders, after years of smoking and sampling a large variety of the best products that the city’s famous coffeeshops had to offer. 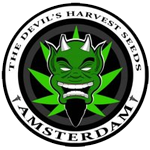 While Amsterdam’s smoke dens certainly provide quality products, the Devil’s Harvest Seed Company lads decided that the time had come to create some really potent stuff: the best flavours, highest yields and strongest punch possible, with the shortest viable flowering period. Lovingly combining solid old-school genetics with newer strains results in some of the most unique and sought-after strains in the industry. Within the following pages is an introduction to some of the freshest and most exciting varieties that are currently taking the coffeeshops of Amsterdam by storm. Whether it’s the Dazy Jones for a heavy knockout effect, John Doe for something completely new or the super tasty Strawberry Diesel, you won’t want to be the last in your neighbourhood with a “devilish” secret at home.